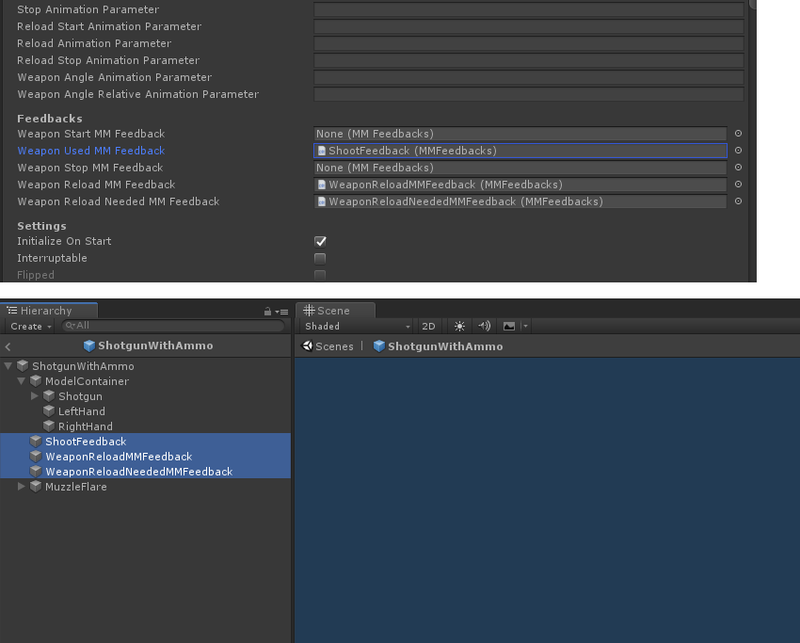 This page explains how to add feedback to all aspects of your game using the TopDown Engine. Feedback in games is super important. Whether it’s visual feedback, haptic vibrations, sound, or anything else, feedback is the sum of things that happen whenever something happens, in general or in reaction to the player’s input. This will ensure the player always understands the consequences of their actions. The TopDown Engine is built with that in mind at all levels, and comes with a lot of classes and prefabs you can use to improve the general feeling of your game. This page highlights a few examples of that. 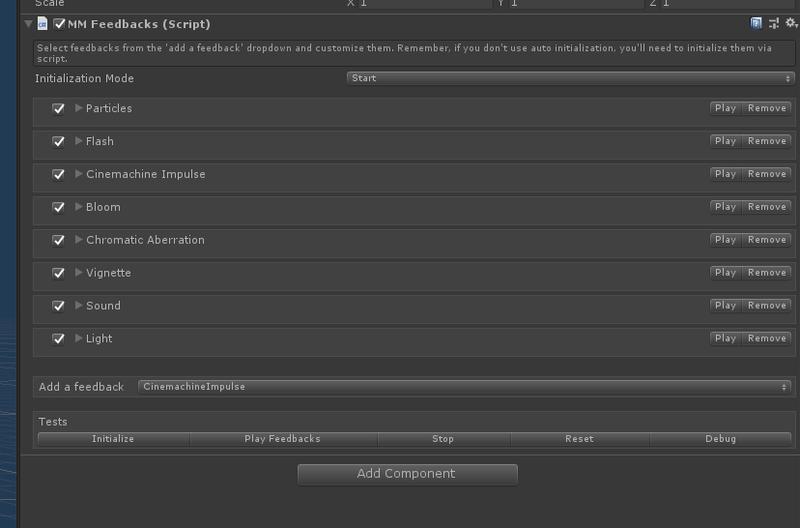 The engine comes with the powerful MMFeedback system, that will allow you to play “feedbacks” with a simple one liner. You’ll find examples of it in many classes, feel free to look at the Dash2D component for reference. Many classes use it : weapons, health, abilities, and more. To use it, all you need to do is create a new empty object, add a MMFeedbacks component to it, and drag it into the weapon’s or ability’s slot. Then, in the MMFeedbacks inspector, you’ll need to add the feedbacks you want from the feedbacks list, and tweak them individually. Once you’re done, you can press play to test your ability (or weapon, or whatever you’re triggering that feedback with). You can also, on play mode, use the test buttons to test how your feedbacks behave. The MMFeedbacks class exposes a bunch of methods, notably PlayFeedbacks(). This class will allow you to trigger many feedbacks at once, using only one line. To take advantage of the MMFeedbacks system in your own classes, all you have to do is declare a public MMFeedbacks (the S is important) in your class or ability, and then use its PlayFeedbacks() and StopFeedbacks() methods to trigger it, anywhere you want. It will automatically add the panel above to your class’ inspector, from which you’ll be able to add, remove and customize feedbacks. Probably my personal favorite, screen shake will add a lot of impact to your game, and will help sell the power of a weapon or the force of a jump. In the engine, you’ll be able to use sreen shakes directly from certain components, such as Weapons, where you’ll be able to automatically associate a screen shake to the Weapon’s use, or via code directly. To do so, all you’ll have to do is call the CameraController’s Shake method, passing it ShakeParameters (duration, intensity and frequency). You can look at the CharacterDive ability class for an example of how it’s done. Alternatively, you can use the MMTools’ ScreenShakeEvents and add an MMCameraShaker component to your camera to grab this event and shake your camera for you. Stopping, accelerating or slowing down the flow of time will allow you to highlight certain actions in your game. Maybe you’ll want to add freeze frames on hit, like in Street Fighter games, or you’ll want to slow down the action smoothly when a boss dies. All that can be done super easily in the TopDown Engine, thanks to the MMTimeManager class. You’ll need to add that to an empty object in your scene, and from there you’ll be able to manipulate time using simple, one liner events. The MMTimeManager class comes with many more options, so don’t hesitate to check its documentation (or look at its code) for more details. The important thing to know is that it works as a stack, so you can slow down time, then slow it down more, then pause, unpause, freeze a frame, and all that will work together nicely as long as you only modify the time using it, and not via the native timescale API. Feedback can be very obvious, such as a screen shake, but it can also be more subtle. Having nice health bars that flash and animate is a nice way to communicate a change in health on a character in a very clear way. The engine comes with the MMHealthBar component, a very powerful way to create nice looking health bars. To use it, just put it on a Character with a Health component. From its inspector, you’ll be able to define its colors, animation speed, delays, bump animation, and more. You can decide to have the engine draw it for you, or you can create your own visuals and use them. Again, feedback is one of the pillars of the engine, so pretty much every component will provide you with options to make things feel better. Whether it’s setting up animations, adding visual or sound effects when things happen (death, hit…), adding knockback to weapons, particle effects when touching the ground, or adding spread to your projectiles, I’d recommend you use these to push your game to the next level. If you want to push things even further, you may want to take a look at Nice Vibrations. It’s another More Mountains asset, that will allow you to trigger haptic feedback (tiny, very pleasing vibrations) on mobile devices using only one line of code. Of course, this works on both Android and iOS.